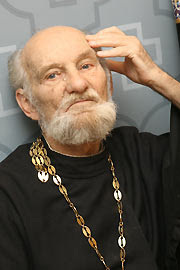 вторник, 16 февраля 2010 г. In the first half of last century, the Chinese city of Harbin, located in the province of Manchuria, was often called the Russian city. The point is that it was founded in the late XIX century, by the Russian railway workers, who were building and servicing the Chinese Eastern Railway. Many staff members of KVZhD with their families remained in Harbin after the October coup, and then came immigrants from Russia, torn by civil war and destroyed by terror. The percentage of Russian population was here very high. All Harbin's children remember this city with great warmth and love. The same way as Saratov priests - Archpriest Eugene Lanskoy and Archpriest Lazar Novokreschenyh. Same way as currently living in Tokyo Doctor Eugene N. Aksenov, who visited Saratov this summer. Here you find - their precious memories of Russian Harbin. In this edition we publish the first part - a story by Father Eugene Lanskoy. Father inspires respect and love in all for his great life experience, unchanged sense of humor and wisdom. He speaks several foreign languages, is a connoisseur of literature, music and a wonderful storyteller. Above Harbin you could see cupolas of 22 churches. Now only one is open — Pokrov church, where my father, Stepan Timofeyevich, was assistant to Regent. In fact, Harbin was a Russian city. Architecturally, it was a reminder of our Volga cities: Kostroma, Nizhny Novgorod. Homes low, very beautiful - in a modernist style of neoclassicism. All surrounded by greenery and gardens. My parents sung very well. My mother - Polina D. - had a wonderful contralto … My father came to China before the revolution: he was called in the royal army, served in the Russian part of Harbin, stayed there; he worked on the Chinese-Eastern Railway. And he was a Soviet subject, but this did not prevent him to go to church and believe. Mom with Grandmother, from Tsaritsino province, also moved to Harbin before the October coup. In China, my parents met and married. Mom worked at KVZhD as an accountant. My grandmother, Christina G., was a wonderful person. She died in 1959, during a flu epidemic, not reaching her one hundredth birthday, by only three months. She was illiterate; she did not speak a word in Russian - only in Ukrainian, because my family is from Ukraine. 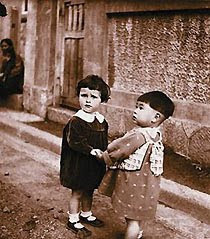 But my illiterate grandmother kneeled, began to pray … She knew so many prayers! And recited them in old Slavonic. All of them she remembered by memory. But Helen Vonifatevna lived on Novotorgovoy street in the center of Harbin, so she took me to St Nicholas church. 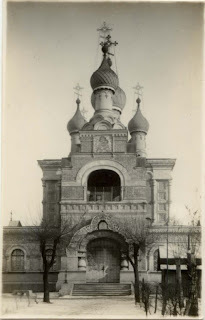 It was a cathedral church, consecrated in honor of the patron of Harbin, St. Nicholas. It was there that I learned and fell in love with the prayer of Saint Ephrem of Syrian "Lord and Master of my life…" - thanks to Helen Vonifatevna. She was able to explain all dogmas, religious rules and commandments in such a way that to abandon them was impossible. I think she was a philologist by training, and a person of strong faith. I've heard that in Harbin they are going to restore the cathedral - after it had burned by the Red Guards. It stood in the city center, beautiful, surrounded by the park. 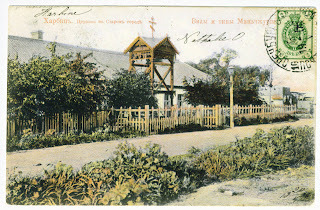 The Cathedral was built on the same principles that the churches in Kizhy: made of wood and without a single nail … the place where the cathedral once stood, visitors are still calling it the Cathedral Square. Great Lent begins. We children, in general, did not care anyway, because on the table there has always been such an abundance of meatless dishes, which could well compete with our modern meat table. In Harbin, fish was allowed during Lent. There was famous navaga, keta, amur and sungariyskaya muksum fish - everything was prepared very tasty. We, the children thought that Lent stretches a century. Now sometimes I want to suspend it: "It is Holy Monday, and before you look around — it is already Cross bearing week… Then everything was different. Especially difficult was the last week: a strict fast, continually in the temple, kneeling prayer - and at the same time, the house and the neighborhood filled with unbearable aromas: the hostesses were preparing for the Great Pascha. In the courtyard we had our own smokehouse — we smoked ham surrounded by dough. They were baking kulich (special sweet bread), preparing cheese paskha (sort of cheese cake) - to us, boys, it was difficult to survive all of this, but — Pascha was coming. Holiday! In Harbin there were amazing Pascha nights. From Great Saturday to Sunday the whole town was immersed in darkness. And exactly at midnight, when for the first time in front of locked doors of the church priests were saying "Christ is Risen! ", suddenly over all the churches the crosses were lit. Illumination, of course, but there was a feeling that crosses sailing in the air, cutting the darkness. Nativity and Pascha in Harbin is impossible to describe. In our home in the dining room stood a huge table, which at the time of the celebration was all covered by different dishes. At Christmas it was covered with straw, with white cloth on top - in the Ukrainian tradition. Table was laid already in the evening of Christmas Eve - hearty, tasty, and meatless: there were all sorts of mushroom dishes. And the next day one ate ham, sausage, and feed piglets, caviar. There were a lot of fruits: bananas, pineapples, oranges. At Pascha all had paschal meal at night and in the morning visits began. There was this custom. The visitors got into a horse driven cart, and traveled to acquaintances. They entered, interchanged a triple kiss, had a small glass, ate and left. And then, after a few hours you can see this visitor: Chinese driver can barely take him, sleepy and happy. China — is a nation of remarkable adaptability. I remember, they sensed: if something is needed, then immediately they prepared, did it. When in all the churches in Harbin on the Holy Thursday service of reading of the Twelve Gospels was going on, but everywhere they were selling already beautiful Chinese lanterns, so that after service the candle, not extinguished, could be put there and taken home. The entire town then was filled with tongues of light… In the morning the Chinese went through the streets of - they were called "go" - with a wooden beam across the shoulders and the two baskets. There was all the produce that was needed by the housewife for the day. The Chinese called Russian men "captain", and women — "Madama". So early in the morning, my grandmother - elderly, she did not sleep well - went to take a breath of air, stood at the gate, and "go", after seeing her, screamed: "Madama, tsibuli nema". In Ukrainian it means: "no onion". The Chinese treated the Russians and their faith very well. There is story with a Chinese, who begun to sink and was miraculously saved. He fell into the river Sungari, but the river is frightening, dissolved in water there is yellowish residue, wood? ( some sort of plant) that is why it seems cloudy. And in one who is drowning the lungs quickly clog by this plant, and — it is the end. This Chinese man was so frightened, and shouted: "Russian grandfather, save me", he meant St. Nicholas, patron saint of Harbin. And suddenly he lost consciousness. He regained conscience - knee-deep in water close to the shore. He got up, took a breath and went to the station. There was an icon of the saint, before it is was an inextinguishable icon lamp. The Chinese man fell to his knees before the icon and the next day was baptized with the name Nicholas. By the way, very many of his fellow tribesmen then took Holy Baptism, and many - with the name of Nicholas. Fact - in Harbin during the war there was not a single bomb dropped. In Harbin, our director, Mr. Lindsley was studying in the English College; he walked with monocle, dressed in a strict gray suit - a typical son of Albion. He wanted his students to grow up as real gentlemen, men. There was a promise between people of Harbin who left and those who stayed.. If in Russia, everything was all bad, it was necessary to send to Harbin a letter with the code words: "Everything is good here, when you arrive, stay at the Kalashnikov". Kalashnikov — were white emigrants, and they could not be found in Russia, so that phrase meant: do not go. My father and my mother received a letter with this phrase, but nonetheless we went. Father wanted to go home, to the Ukrainian city of Kamenetz-Podolsk. He did not want to believe anything bad was happening there, but someone told him that in the Soviet Union the dentists were hard to find. And he took me to treat my tooth. This Harbin's filling is still intact. Our acquaintance with Russia occurred at the station Otpor: in the car where people from Harbin were they had a search. When we arrived, it was necessary to rent a room in a ramshackle house. One month later, Dad was arrested, given ten years without the right to correspond. That meant one thing only- shooting— My mother was taken a month later. So we became enemies of the people, children of the arrested. In Saratov I was studying at school number 47. I managed to hide the truth about my parents. At first I thought, it is dishonest, I worried… but then I realized: if people were suffering for a much lighter fault than I had, though I was not to blame, what will happen to me? But I always had a cross; on the chest I carried a prayer. I prayed quietly. Nobody suspected this. For the first time in the Soviet Union, I crossed the threshold of the church in 1970s. This was in the Lithuanian city of Druskininkai, in the church of Our Lady Mother of God "Joy of All Who Sorrow". I could not resist it - and before that I did not even acknowledged that I was a believer… After Lithuania in Saratov I did not hide it. I went to Duhososhestvensky (Descent of the Spirit) Cathedral. And there I was noticed by Archbishop Pimen. When we met, he immediately told me: "I have seen you when I blessed people from a pulpit, and realized then that you are the future deacon". That was 1977. In 1988, all commissioners disappeared. And in 1989, during the Entrance of the Holy Theotokos to the temple, in the Trinity church I was ordained as a priest. Since that day of ordination to this day I serve in the Holy Trinity Cathedral. Only there. I gave Vladyka Pimen my word that I will never leave. Before the ordination, he wanted to make me the priest-in-charge of the temple in honor of the icon of the Mother of God "Assuage my sorrows", which just had opened. But I asked him not to do so. After all, the rector, in additional to a strong faith in Christ, must have something else, additional properties of character. It is better to be the twelfth parish priest in any church. Come and see how THOUSAND of people like YOU are earning their LIVING online and are living their dreams TODAY.